Everyone's a bit nuts for hidden codes and games these days, aren't they? I fully approve. The latest to join this particular train is Prison Break (yum) - this is a bit of a spoiler for the Euros, because I'm not even sure Prison Break is showing on any Euro TV at the moment, so sorry if you're watching via DVD/internet. How to decode the dotted crane message. 7 3 6 3 3 9 8 6 8 7 = "Phone number" Michael gave Sara on the crane. ... .. .. . .. .... ... ... .. .... = First line of dots on the crane from Ep 201. 3 2 2 1 2 4 3 3 2 4 = The dots, converted to numbers. 3 2 2 1 2 4 3 3 2 4 = Letters for each number above it. For example, (7, 3). The third letter on the number 7 is R. Then (3, 2). The second letter on number three is E. Following this pattern, the first line of the dots combined with the new phone number spells out... "R E N D E Z V O U S" - which is French for "meeting" or "get together". We did the same thing for the phone number given on the 9/25 episode which gave us the message "SUNDOWN HOT"
and from a special source, we have learned that the last set of #s is 35445266 which gives the message "ELGILANM"
spaced out correctly, the message is - "Rendezvous - Sundown Hotel - Gila, NM"
hey i lv pb cnt belive u worked the codes owt. i live england n it is showin at the mo. we on ep 211 n u finish the 2 series nxt mon dont u???? thats wot i read nyway!!! ldz ov ppl here lv it!! u get soooo hooked!! lvin american webbies like this cos i can pre read wot is gunna appen nxt!!! 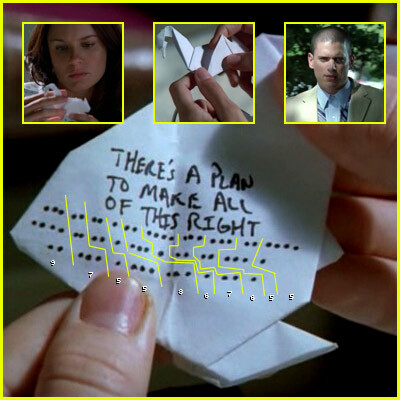 oh wow i never understood that code.. michael is so clever..
i am totally in love with prison break..
i would like to thank fox productions for doing the prison break site. it has season 2 recaps and as we are only on episode 14 i would love to find out what happens next..
i cant believe what could hapen in season 3 and i cant wait!!! Anybody know anything about the red dots that are falshing at the bottom of the screen on the new season?